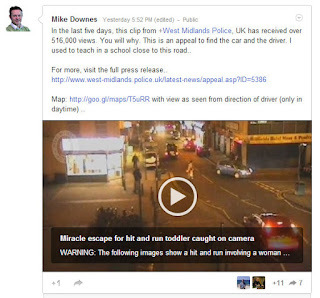 The first account was created just over four years ago on 15 Dec 2008 by West Midlands Police. To date, they've made 16,187 tweets which averages at 10.6 a day. What I find fascinating, is how the first account was opened on 15 Dec 08 and the last in 15 Aug 2011, making the average account opened around 23 Nov 2009. That's 343 days after the first account. So in theory, when one organisation tales the lead, it takes nearly a year for everyone else to follow suit. The reason I'm detailing the opening of Twitter accounts is so I can cope with the future. 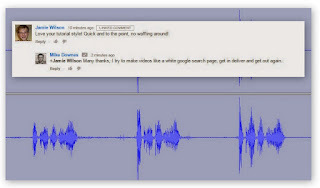 It's no secret video technology like Google+ Hangouts are every now. They are fast, easy and far reaching. So far, 290,436 tweets have been made by these fifty two forces. If you want some thinking points, consider how each account has at least one person pressing the buttons. If you combine the days on Twitter, it's a massive 61,448. That means the accounts have been open for 168 years. That's a long time. What I'm getting at, is the need to collaborate. In this digital age, we need not reinvent the wheel, just go to the library and look up Transport. There is a diverse range with one force making over 21,000 tweets and another just 1,216. This is a similar range with the number of tweets in a day, with the same force making 16.32 while another just 0.85. I've make the data really simple and hopefully personable. There are many services out there (ie TwitterStats), offering to chart your tweets with a spread of colourful graphics. As I'm a Teacher, I do not subscribe to these sites unless they make a vital point. I'm not in the business to produce a vast array of visualizations for the sake of it or to entertain. As always, I looked on the web, hoping to find a data set like this - I couldn't, if you know of one, let me know. For me, I'm looking next to see what is being tweeted and especially how much video. I've always said Twitter is like a wedge, where the thin end is the tweet leading to something much larger. And by that I mean realtime officers making short video clips. And by that I would suggest a tool that can take people who are doing the same job, but are separate and bring them together. For example, the West Midlands Police published a video of a hit and run where a mother and toddler were crossing a road in Coventry. The video's now had 544,005 views in six days. If I could make it happen, I would produce a LIVE Hangout On Air from ten different locations where crossing a road is dangerous. I would have the cameras show what is good and bad practice. I would then have the cameras follow an officer and/or PCSO in realtime, pressing the buttons on crossing, waiting patiently at a Zebra crossing and then make it all available on YouTube afterwards. 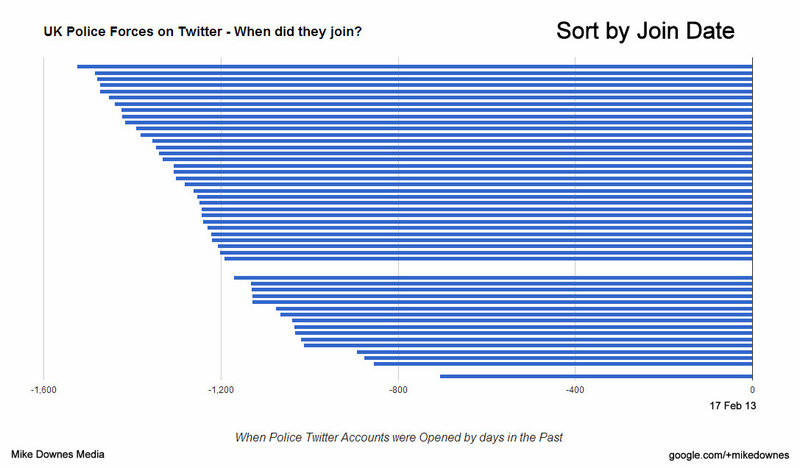 This post lead with a chart on how the UK Police got started with Twitter. I can make a similar chart on Hangouts On Air. There are two forces active. I can only be open and honest - I have no patience to wait one year in the future for the average pick up rate. The good news, I know of three forces who are thinking right now and not in the dozen. Nice work Mike. Interesting stuff. 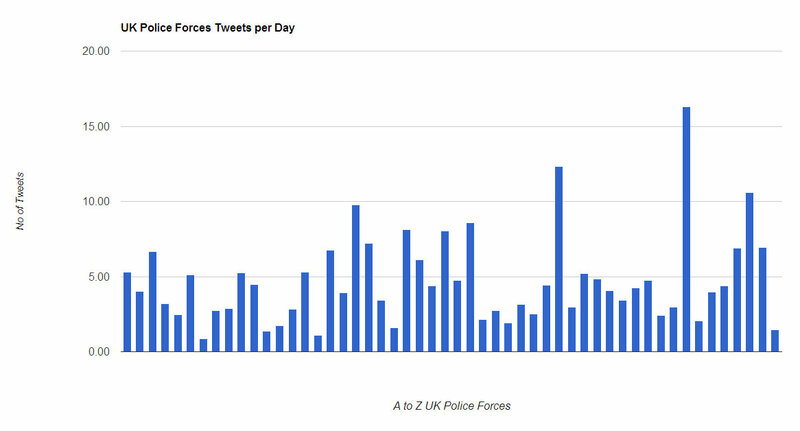 Would be interesting to see if the number of tweets per day correlates to anything like the number of recorded crimes,or recorded incidents or even the size of the force geographical/staff numbers. Thanks, That's something I looking at, but have no real expertise at. I'm looking at giving the support I can in the areas I know about. Mostly education and realtime video. A lot of work here! I would like to add a few observations. 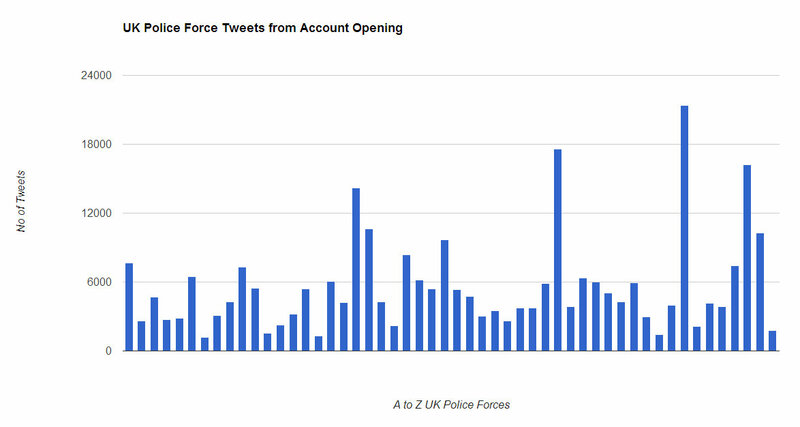 Because a Twitter account was opened on a particular date, it doesn't necessarily mean the force started tweeting regularly and effectively from that point. It may be worth looking at the first tweets and noting the frequency to assess if there was any delay between the account being created and a 'regular service' being established. There are many factors which determine when and why forces would start using any particular service such as Twitter. In the case of the early adopters, it could be down to a more progressive and forward-thinking force or simply down to an individual who decided to register the account for future use on behalf of their force (not dissimilar to registering URLs). This is common practice these days and many forces have registered accounts in various social media sites with no activity so far. Others may have set up an early 'test account' to practice with or conduct some trials with before registering the 'official' account which was consequently used from that point onwards. The volume of tweets as an average could be misleading. 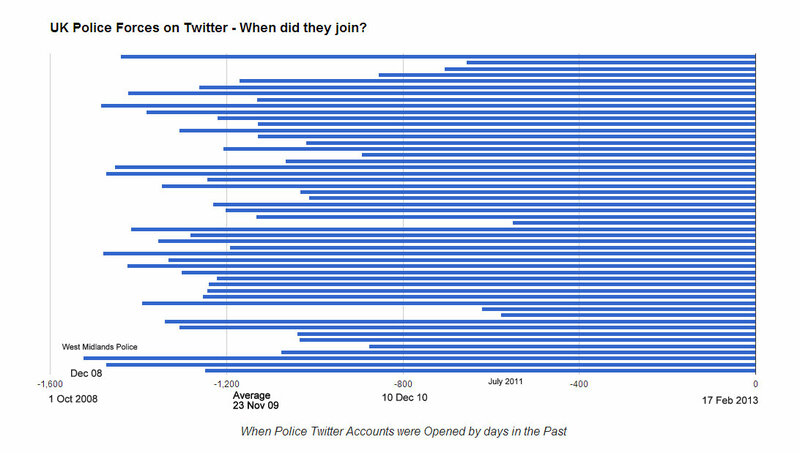 GMP conducted their well documented 24 hour tweet marathon in 2010 where they tweeted so many tweets during that period of time that they had to employ several back-up accounts to avoid TwitJail.